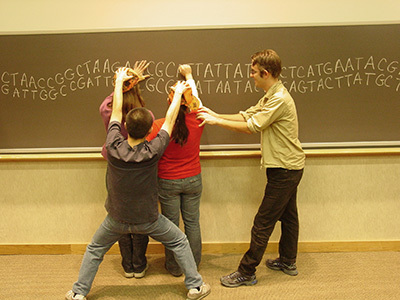 Students in Susan Strome's genetics classes don't just listen to her lecture. They work with pipe cleaners and beads as model chromosomes and sometimes even perform skits to act out molecular interactions. 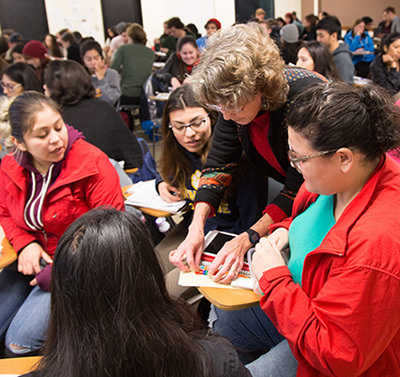 A growing number of UC Santa Cruz professors are changing the way they teach their classes, doing less lecturing and using more "active learning" strategies to get students engaged with the material. Some faculty have "flipped" their classrooms, recording lectures on video for students to watch before class and using class time for problem-solving activities. Others use "clickers," an interactive technology that lets teachers ask questions during class and immediately collect and view the responses of the entire class. "There's an increasing movement toward active learning because, even with the best lecturers, students still don't learn as well when they're just listening as they do when they are grappling with the concepts themselves," said Strome, professor of molecular, cell, and developmental (MCD) biology. Strome is teaching a completely redesigned version of her genetics course in winter quarter that is even more interactive, she said. Funds from the UC Presidential Chair she was awarded this year enabled Strome's department to hire an additional instructor so that she can try the new approach in a smaller section of about 90 students instead of the usual 300. While many faculty members have redesigned courses and adopted new teaching strategies on their own, a major grant from the Howard Hughes Medical Institute (HHMI) is funding a broad-based effort in the Division of Physical and Biological Sciences to revamp the introductory science courses in biology, chemistry, and physics. One of the goals is to increase persistence in the STEM fields (science, technology, engineering, and mathematics) so that more of the students who start college expressing an interest in science stick with it and graduate with a STEM degree. Of particular concern is the high attrition rate among students from underrepresented groups and those who are the first in their family to attend college. "The problem is that these large lecture classes are not conducive to deep learning, so the introductory courses become a kind of selection process to see who can survive. And we know that active learning techniques reach a broader cross section of the students more effectively than lectures alone," said Manny Ares, professor of MCD biology and associate dean of physical and biological sciences. Ares, who is overseeing the development of the new introductory biology courses, said studies have already shown that reduced class sizes and active learning strategies can help level the playing field for all students. The new approach will be used initially in a special active learning section of about 100 students that is being taught separately from the regular intro biology class in winter 2016. "There are two components to what we're trying to do--reducing class size and getting students more engaged with the subject matter--and both require more instructor time," Ares said. "With 1,500 students a year going through introductory biology, it's a challenge." The HHMI grant is funding three new postdoctoral teaching fellows to develop active learning modules and serve as instructors for the transformed introductory science classes. "We want to develop a whole set of good teaching modules that busy faculty members can adopt and use in their classes," Ares said. 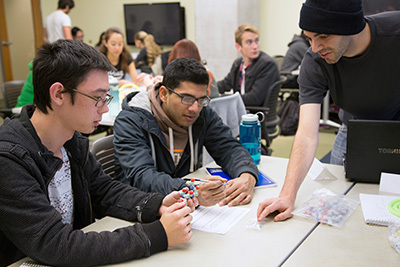 Graduate students affiliated with UCSC's Institute for Scientist and Engineer Educators (ISEE) are also contributing to the development of lessons for use in the new classes. ISEE director Lisa Hunter said the HHMI grant is tying together a lot of ongoing efforts to implement innovative approaches to teaching. The institute, which grew out of the Center for Adaptive Optics, has been training graduate students in effective teaching methods since 2001 through its Professional Development Program and is now accepting applications for the 2016 program. "Graduate students are an integral part of the UCSC teaching community. They teach labs and discussion sections, and they are learning skills and a mindset that will shape the way they teach for the rest of their careers. If we truly want to change how STEM is taught at universities, we have to change the way we are training today's graduate students," Hunter said. The HHMI grant has also led to a new monthly seminar series, the STEM Active Learning Seminar, which brings the UCSC teaching community together to share teaching techniques and experiences. Tisha Bohr, an MCD biology graduate student in the ISEE program, and Ian Marcus, an HHMI postdoctoral teaching fellow, took the lead in starting the seminar. Strome said she began changing her teaching style in 2003 after participating in an intensive workshop at Indiana University. Among the most challenging concepts for students in genetics classes is understanding chromosomes and what happens to them when cells divide, so she began passing out colored pipe cleaners to represent chromosomes and beads to represent genes on the chromosomes, so that students could work through the process themselves. 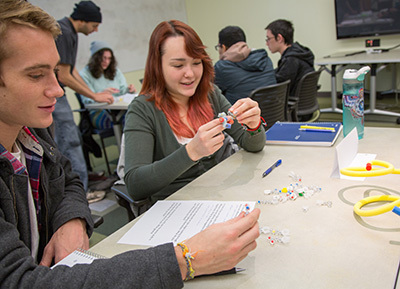 "The diagrams in the textbooks can be confusing, but working with pipe cleaners gives students a visual and tactile experience that helps them understand and remember it better," Strome said. Over the years, she has added more exercises like this to her classes. Strome said she advises younger colleagues who are interested in taking an active learning approach to make changes gradually and assess their effectiveness. That's what Matthew Clapham did, and eventually he completely flipped the invertebrate paleontology and sedimentology classes he teaches. Clapham, an associate professor of Earth and planetary sciences, said he gradually started lecturing less and spending more time on in-class activities. Now he records his lectures and has students watch them in advance so they can spend class time doing exercises and working on problems. "There is strong evidence now that active learning strategies lead to better outcomes for students, especially for those from underrepresented groups," he said. "My own impression is that the students are more engaged with the material and are able to talk about it in a more sophisticated way." Clapham's classes are relatively small, which allows him and a teaching assistant to circulate through the room and answer questions while students are working. Larger classes present more challenges, especially when there are hundreds of students in a lecture hall with fixed seating, making it hard for students to work in groups. "In small classes it's easy to have a lot of interaction. With bigger classes you have to be more proactive in getting students engaged," said Kathleen Kay, associate professor of ecology and evolutionary biology. Kay teaches evolution in a large lecture hall, as well as a smaller class on systematic botany. She hasn't flipped her classrooms, but she has incorporated active learning activities and uses clickers to keep students engaged and to get instant feedback on how well they are understanding the material. "I enjoy it a lot more. It makes class more fun, because I'm actually interacting with the students," Kay said. "Lecturing probably works well for students with a good foundation, who take good notes and are self-motivated to study, but I realized I wasn't reaching a large portion of my students." The active learning approach gives students more responsibility for their own learning, and many students may prefer traditional lectures. It remains to be seen what mix of strategies will best serve the large numbers of students taking introductory science classes, said Paul Koch, dean of physical and biological sciences. Some of the active learning modules being developed can be scaled up for use in larger classes, while others could be used in smaller discussion sections or in supplemental programs, such as the Modified Supplemental Instruction offered with many undergraduate courses. "Some of the ideas we develop will be useful in large classes, or we may find that the smaller classes are so successful we'll just have to figure out how to offer them to all students," Koch said.